Bicester is a fast growing town in Oxfordshire. 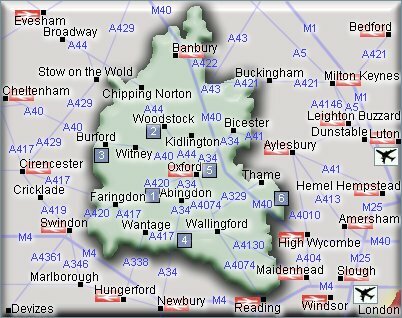 Nearby places include Banbury, Kidlington, Brackley, Buckingham, Oxford, and Witney. Bicester - Travel by coach - If you'd like to speak to someone about your journey you can ring Traveline on 0871 200 22 33. Bicester - Travel by road - Bicester is about 3 miles NE of Junction 9 of the M 40 Motorway. The M 40 Motorway links London to the West Midlands. Bicester is about 55 miles from Solihull, Birmingham and 65 miles from London. Bicester - Travel by train - Bicester Town Station, London Road, Bicester, Oxfordshire, OX26 6HU. Customer service 08457 000 125. Unstaffed. Bicester is 15 miles SE of Banbury, 10 miles north of Oxford and 15 miles west of Aylesbury. 2 miles southwest of Bicester. Bicester - Shopping - Marks & Spencer Bicester Simply Food, 44/46 Sheep Street, Bicester, OX26 6LG. Tel: 01869 248187. Woolworths - 12 Sheep Street, Bicester, OX26 6LA, Tel: 01869 252349. Bicester - Other information - Waddesdon Manor, Waddesdon, Nr Aylesbury, Buckinghamshire HP18 OJH Tel: 01296 653226. Rousham House and Garden, Nr Steeple Aston, Bicester, Oxfordshire Tel: 018869 347110. For hotels accommodation in other areas nearby see Aylesbury hotels & Oxford hotels. Bicester is about 3 miles NE of Junction 9 of the M 40 Motorway. Rail Stations (Not all stations shown). There is a station in Bicester.